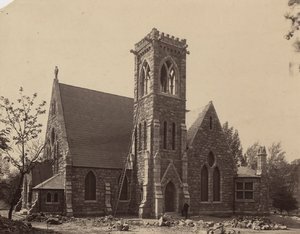 A chapel was finally built on grounds in the 1880s after a successful campaign led by women dedicated to the spiritual needs of the University community. Designed by Baltimore architect and University alumnus Charles Emmet Cassell, the chapel’s materials, site, and style signify it as a Christian building in contrast to the Academical Village. Upon the chapel’s dedication, Professor Maximilian Schele de Vere proclaimed that while the Rotunda represented “in cold though classic beauty the outlines of a pagan temple,” the chapel aspired to heaven with its “pointed window” and “flying buttress.” Built of rough stone and complete with gargoyle rainspouts, the Gothic Revival chapel on the west side of the Annex balanced Brooks Hall on the east. 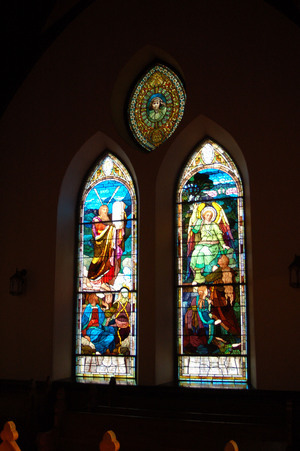 The sanctuary’s colorful windows were part of the opalescent glass movement pioneered by Louis Comfort Tiffany’s Studios, who designed the small mandorla window in the east transept. J. & R. Lamb and Sons provided the large windows in the chancel and transepts.